This panel depicting an Old Testament prophet, and nine others in the museum's collections (Mus.nos. 5-5E-1881 and 6-6C-1881), formed part of a 'Jesse Tree' window. 'Jesse Tree' windows are a visual representation of Jesus Christ's genealogy which was traced back to Jesse, the father of the Old Testament Prophet/King David. These prophets announce the coming of Christ from the line of David and appear on the Tree accompanying images of Christ's royal ancestors. The whole window would have culminated at the top with either an image of Jesus Christ or an image of the Christ Child with his mother, Mary. At the bottom of the window would have been an image of Jesse from whom the genealogical Tree emerges. The prophet here can be identified by the name 'EZECHUEL' (Ezekiel). He lived in the 6th century BC and his prophecies are recorded in the Old Testament Book of Ezekiel. This prophet announced the triumph of the Kingdom of the Messiah and is thus intimately associated with the geneaology of Jesus Christ. Jesse Trees with their kings and prophets were produced in all forms of church art from the 11th century and throughout the medieval period. There was no standard convention for the depiction of the prophets and the kings. The style of painting on this figure is the same as on those in panels 5E and 6 to 6B-1881. The facial features are full and rounded. The eyebrows are heavy and the eyes and pupils of the eyes are large. The clothing follows the form of the body. The figures' hair is straight and not curled. These figures are identified by their inscribed scrolls, have a large stemmed flower within the demi-quatrefoil they stand in and there are no small sections of ground between their feet. All of these feaures distinguish this group of prophets from the other group (5 to 5C-1881). Most of the prophet figures in this collection are paired, are mirror images of each other, indicating that each pair was made from the same cartoon or design drawing. 5D and 6C-1881 are exceptions and it is likely that there was originally a pair to each. Two other panels in the museum (Mus.nos. 6D and 6E-1881) depict Kings from a 'Jesse Tree' window but were not originally part of this series of prophets panels. E Z E C H U E L bordered top and bottom. The figure is placed within a half quatrefoil. His left foot rests on top of the lower inner border of the quatrefoil and his right foot is placed behind the lower inner border of the quatrefoil and is not visible. There are floral sprays of blue, green, yellow and clear glass in the upper and lower spandrels of the quatrefoil. On the left of the panel is a vertical border of floral sprays composed of clear, green and brown glass. This border floral pattern is broken in the middle where it is dissected by the left projection of the quatrefoil. 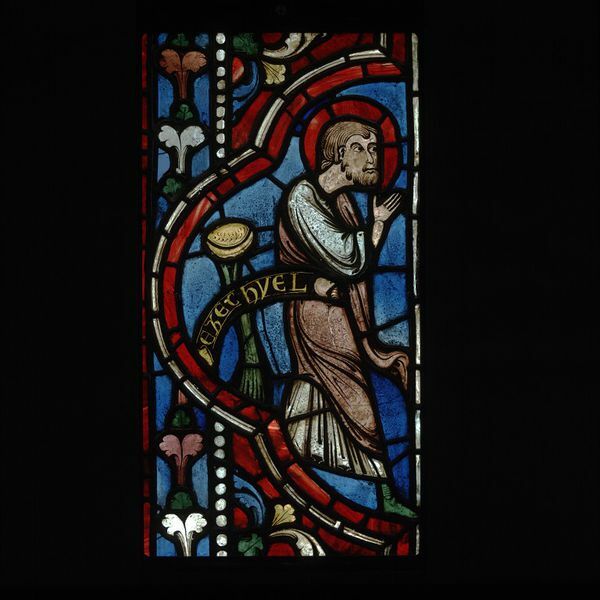 At the time of acquisition, it was believed that this panel and others in the V&A's collection (5A-E-1881 and 6-6E-1881) had originally been located in the windows of the Sainte Chapelle in Paris. This chapel had been restored in the 19th century and some of the medieval windows were removed. Prior to 1936 opinion had changed and it was thought that the original location of these panels was Troyes Cathedral, possibly in the axial chapel. In 1779 the central window of this axial chapel had been removed. (c.1200) Work started in the eastern choir, leaving the axial chapel last. (c.1200-10) First phase of work. (c.1210-1220s) Second phase of work. (1228) Much wind damage to cathedral and collapse of the upper choir. So there probably had been damage to the Jesse window which would account for a 15-year gap in styles. (1958) Grodecki noted that the V&A prophet panels were of a similar quality to the Jesse panels at Troyes. 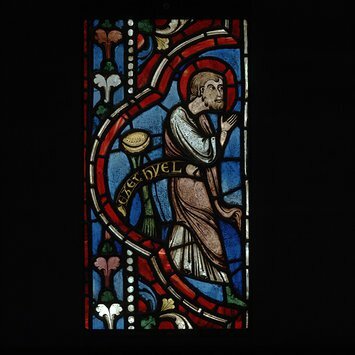 A series of prophets at the V&A have been associated with the glass at Troyes since Grodecki (1958). The dimensions of the panels (65 x 36) fit perfectly in the axial window and complement the trunk figures. However, the prophets of this series are executed with a vaiety of pictorial styles associated with the years 1220 and 1230. This suggest that they were completed in a certain period and that they are probably from a ancient disruption of the glassmaking. Father of David, grandson of Ruth and Boaz. (Old Testament prophet) Isaiah (11:1-3) A shoot shall come out from the stump of Jesse, and a branch shall grow out of his roots. Isaiah (? ): Messiah would come from the House of David. Named in Matthew (1: 5-6) and Luke (3: 22) as an ancestor of Jesus. Minor Prophets: Hosea (Osee), Joel, Amos, Obadiah (Abdias), Johah, Micah (Michea), Nahum, Habakkuk (Habacuc), Zephaniah (Sophonias), Haggai (Aggaeus), Zechariah (Zacharias), Malaachi. A window whose design is based on the descent of Jesus from the royal line of David, usually in the form of a tree springing from Jesse (David's father) and ending in Jesus or the Virgin and Child, with the intermediary descendents placed on scrolls of foliage branching out of each other. Branches are labelled with names of His ancestors. Restored in 19th century so how can be sure of names? If Suger did initiate the idea of representing the Tree of Jesse at Saint-Denis, he did not evolve the design out of nothing. It is reasonable to think the representation in a window was based on an earlier minature. Because a group of prophets appears in the Chartres window, it isn't a given that it came from the Limoges prophet drama. Jesses can have or can not have genealogical tables. This panel depicting an Old Testament prophet and nine others in the museum's collection (Museum nos. 5-5E-1881 and 6-6C-1881) formed part of at least two different 'Jesse Tree' windows. 'Jesse Tree' windows are a visual representation of Jesus Christ's royal genealogy. Christ's ancesters were believe to trace their line back to Jesse, the father of the Old Testament Prophet King David. These prophets announce the coming of Christ from the line of David and appear on the Tree accompanying images of Christ's royal ancestors. The whole window would have culminated at the top with either an image of Jesus Christ or an image of the Christ Child with his mother, Mary. At the bottom of the window there would have been an image of Jesse from whom the genealogical Tree emerges. Two other panels in the museum (Mus.nos. 6D and 6E-1881) depict Kings from a 'Jesse' Tree' window but were not originally part of either of these series of prophets. Panel of clear, coloured and flashed glass with painted details. Depicting the Old Testament prophet Ezekiel, from a Tree of Jesse window. Probably from Troyes Cathedral. Made in France (Champagne), c.1210-1245.